It's been so long since I've written and I have so much to tell you! The last couple months for us have been filled with unexpected happenings. Good, bad, neutral: it all hit at once. The biggest happening isn't quite finalized so I can't share it quite yet. It's so exciting, I can't wait to tell you all! It's a super big thing for us so I want to make sure everything is settled first . What I can tell you is that our small, dated rental bathroom is getting a renovation! It all started with a clogged toilet that overflowed one weekend. Exactly one week later, the sink backed up and then overflowed because a certain little one forgot to turn off the water. Both incidents involved water covering the floor and water pouring through the kitchen ceiling. A few days after the sink overflowed, water started pouring through the ceiling again while the tub was being used. A small chip in the tub had given way and there were two additional slower leaks in the tub plumbing. Not only does all the water damage have to be fixed, but the tub also has to be replaced. Since replacing the tub involves taking out the toilet and fixing the floor and walls, the whole bathroom is getting redone! I've been on cloud nine. Who cares about not having an upstairs bathroom for two weeks if it means a new, pretty bathroom! And I get to help design it? Icing on the cake. This is the first time I've ever had an active part in the design process. It's one thing to decorate what's already there and another to redesign it. Since we don't own the house, I don't have the final say but I do have amazing landlords-in-law who graciously allowed me to help out! The first step was to create a mood or idea board. Behold! 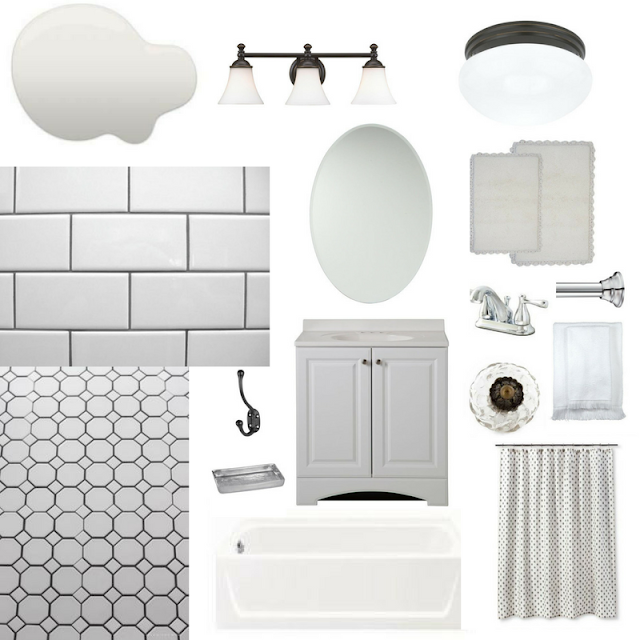 A vintage-inspired bathroom idea board! This house was built in the late 1960's and was built in a more traditional style(see our kitchen cabinets) so I feel like going too modern here is a mistake. My goal is to create a bathroom on a smaller budget that is up to date, classic, and fits the style of the house. Something I would like to live in but that would also appeal to future buyers. I decided on a white bathroom for several reasons. White works really well in a bathroom because it looks clean and flatters every skin tone. I also wanted to lighten up the space as much as possible because it's small and doesn't have much natural light. White is classic, matches everything, and never goes out of style. And I just like white. Of course, I had to add a little farmhouse glam with all the décor and fixtures. Swap those out for something a little more modern though and you got yourself a cool retro bathroom. It could go so many different ways!